The Lost Ones is a work of thriller fiction penned by author Carl Lakeland. Taking adventure fiction into a thrilling supernatural new setting, dystopia looms on planet Earth after the devastation of the Fall Wars. Richard Gabriel is our hero, a man stranded with his family on the USS John Steinbeck and desperate to escape the South Pole before they all freeze to death in the darkness. Richard’s plan is to head for Australia, but the post-war world he discovers reveals a terrifying new future for humanity. It’s a race to survive as these lost souls struggle to find safety and hope in the future. I thoroughly enjoyed every page of this excellent adventure novel. Author Carl Lakeland combines believable heroics with supernatural flair and a stylish dystopian world worthy of any Mad Max or Hunger Games fan’s attention. The style is very much for adult readers, though not extreme in its graphics, and the world in which Richard and his family try to survive is realistically grim. The full gamut of human emotion runs through the novel with well paced peaks and troughs that lull readers one moment, then shock them again the next. Like the heroes themselves, you’ll hardly have a moment to breathe before the next terror is upon you, which makes for an excellent, exciting page turner from beginning to end. Overall, I would certainly recommend The Lost Ones to all dystopian thriller fans, as well as those who love disaster fiction and action novels with heartfelt characters. Richard ‘Ditch’ Gabriel is one of thousands of people descended from the original crew of the USS John Steinbeck, an aircraft carrier stranded on the Ross Ice Shelf in Antarctica. The ship has survived the 150 years since The Fall, a cataclysmic nuclear event, but now its nuclear reactor is finally dying and the blackout is coming. Ditch knows nobody will survive this year, and he’s secretly planned to sneak away with his family and head for Australia. Generations of isolation have not prepared Ditch for what awaits in the world beyond, with continents turned into islands by rising sea levels and factions of humanity turned savage. There is also a mystery to solve in the pages of a dead man’s journal and the helpful orcas following Ditch. Lakeland depicts a stark and desperate view of post-apocalyptic Earth in this intriguing thriller. Danger is a constant in The Lost Ones, whether it comes from the threatening blackout of a polar winter or the cannibal group known as Takers. The narrative occasionally shifts between current events and the entries from the dead man’s journal. While this alternating narrative does slow the pacing somewhat, it adds to the story development and intrigue as the journal provides tantalizing hints of the dystopian Australian society, and clues regarding a valuable figurine and its link to the mysteriously helpful animals and the group of humans known as the Lost Ones. Links to Christian angelic lore add a intriguing facet to the overarching plot. The Lost Ones is a fascinating dystopian thriller with an engaging mystery. 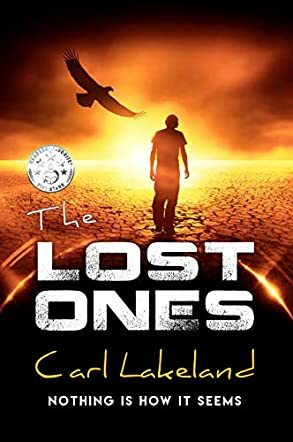 The Lost Ones by Carl Lakeland is a supernatural thriller set in a dystopian world after The Fall, an event which caused the collapse of civilization. The story begins in Antarctica, a cold and thoroughly inhospitable place, where a large group of people is struggling to survive on the USS John Steinbeck, a ship that was thought to be lost many years ago. The survivors, descendants of the original crew, eke out a living but with the nuclear reactor in its death throes and winter nearly upon them, they are all certain to die. One man, Richard Gabriel, hatches a plan to escape, taking a chosen few with him. However, those in charge have enacted strict laws which prohibit leaving the icy enclave. This is the beginning of Richard's dark and difficult journey which takes him back to the remnants of a civilization, a world which he doesn't recognize. This book presents a strange dystopian world where things are not quite what they seem. The Lost Ones is a dark adventure, reminiscent of a Mad Max film, but with deep spiritual overtones. The violence in this new world order contrasts starkly with a rather complex ethereal story line which builds as the novel unfolds. Carl Lakeland writes an imaginative and futuristic thriller. I found the novel engaging and compelling. I liked the fact that there was hope for this rather corrupt and violent world our protagonist found himself living in. The story all came together with a surprising but very satisfying ending. I enjoyed it very much. Like all classic adventure books, The Lost Ones by Carl Lakeland takes the reader right into it at a quick pace. Richard, the protagonist, lives with his family — his brother Jason, his wife Chloe, and his mother — on the USS John Steinbeck in Antarctica. But he wants to leave before all their fuel is consumed and they have to face death in the cold nights of the South Pole. The plan to escape is clear, but something goes wrong, and when Richard finally sets himself free, he realizes that nothing is as he expected. Earth after the Fall Wars faces a dystopian future where humans, kill, steal and even eat each other to survive. And when Richard finds a journal, his journey becomes something he did not expect. Love, loss, pain, friendship, death, hunger, war, slavery and faith are the main ingredients of this fantasy story in a dystopian but not so much impossible future. The Lost Ones is the perfect book for adventure and supernatural fans. Despite the innumerable battles taking place throughout the novel, the sensation that something spiritual is weaving the story line - as one would expect from a plot-driven story - is always present, together with the sense of loss for a past that will never come back and for a future that may bring something worse. The divine intervention is at every turn of the tide, but that does not always mean a successful battle against the odds. Carl Lakeland is an artist in keeping the reader riveted with bated breath. However, despite the spiritual nature of the story, it is not for the faint of heart. In The Lost Ones by Carl Lakeland, the USS John Steinbeck supposedly destroyed by the Japanese 150 years ago is, in fact, abandoned in Antarctica. One of the surviving descendants, Richard 'Ditch' Gabriel, knows that with the nuclear reactor losing power, there will be no electricity or means of heat when the months of blackout arrive. His only means of survival is to escape with his family to Australia. The plan does not go as anticipated and Richard is plunged into a world of legend and a search for treasure while trying to elude capture by the notorious and savage clan known as the 'Takers'. Ditch and his friends have little time to find the Angel Of Bunjil and the Sacred Bones and return them to their rightful owners as the Takers are closing in. The author has a masterful skill in creating a story with intrigue and suspense from the first chapter. His characters jump out of the pages and their personality flaws make them even more realistic. The relationship between Ditch and his brother, and also the wonderful character of Captain Henry Bass was so endearing. The conflicts in the plot really keep you wondering what catastrophes await Ditch; the tension and excitement are endless, making this a novel hard to put down. The subplot involving Michael was equally as strong and captivating. Although the story is set on the high seas in a time and place unknown, the concepts of friendships, values and morals are so relatable. Ditch is faced with many dilemmas and hard choices throughout and it is hard not to ponder what you would do in a similar situation.